Still adding to my collection of Christmas cards and I feel like I am making progress. Playing along today in a couple of challenges with this very simple holiday card. Using the Misti and Memento markers made stamping this tree branch 4 times sooooooo easy. I love this "simple" card and I don't think it looks simple at all, rather quite beautiful! 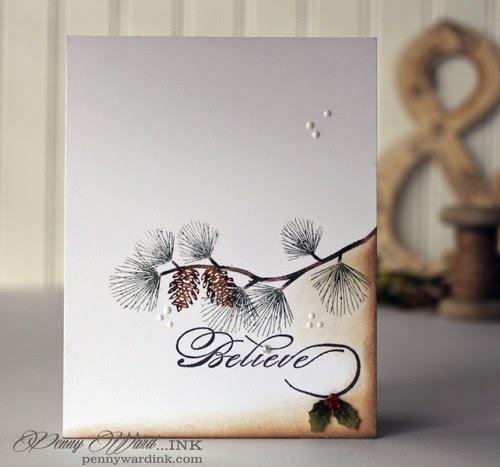 I love that stamp and the IO holly leaves are a perfect addition! Thanks for playing along with us at Scrapy Land Challenge # 16! Gorgeous!! I love it. Thank you for playing along with Merry Monday. What a beautiful design, Penny! I love that branch and the bit of holly! And your sponging on one corner is brilliant! Thanks for sharing this with us at Merry Monday! Love that pine branch and the inking in the corner. 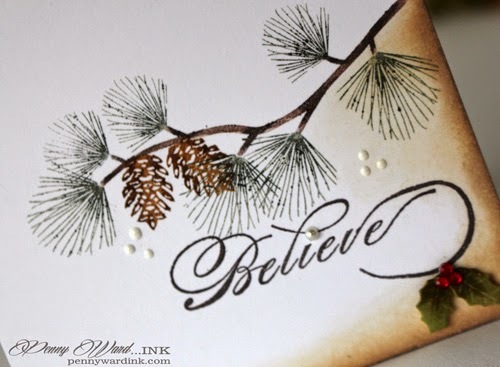 Oh, man - I am so drawn to Christmas cards like this one - I love the pine cones and the evergreen tree spray!! What a gorgeous job you have done with this CAS card that simply showcases the lovely images!! Super terrific and I am in love with this!! This is one stunning card, Penny! I love your shading just in the corner! So pretty. Thank you for joining us at Merry Monday! Beautiful! I love your festive take on the sketch! This is so stunning! I love the movement it creates and all the white space! Gorgeous! LOVE THIS! So clean and elegant. Beautiful. So pretty! Love the selective edging - it gives depth to your beautiful design! What a gorgeous card. Very elegant and clean ans simple. Oooh, I like the sponging spread out on one corner only! Gorgeous card! Thanks for playing Merry Monday with us! Oh SO pretty, Penny! Love this clean, crisp card and your beautiful image! Fabulous card! Thanks for playing along with us this week over at Merry Monday! Simply gorgeous! And a wonderful take on the sketch, too. This is gorgeous!! CAS perfection!!! Absolutely delightful CAS design! Thanks for sharing at Merry Monday this week.